The 16"/50 caliber Mark 7 – United States Naval Gun was the main armament of the Iowa-class battleships. 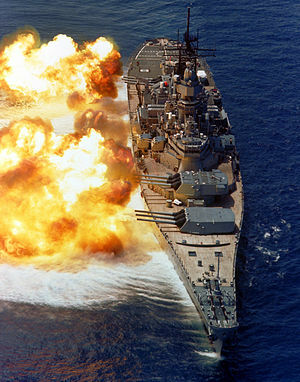 The Iowa-class battleship USS Iowa fires a full broadside of her 16"/50 Mark 7 guns. Due to a lack of communication during design, the Bureau of Ordnance assumed the Iowa class would use the 16"/50 Mark 2 guns constructed for the 1920 South Dakota-class battleships. However, the Bureau of Construction and Repair assumed that the ships would carry a new, lighter, more compact 16"/50 and designed the ships with barbettes too small to accommodate a 16"/50 Mark 2 three-gun turret. The new 16"/50 Mark 7 was designed to resolve this conflict. These guns were 50 calibers long—or 50 times their 16-inch (406 mm) bore diameter, which makes the barrels 66.6 feet (20 m) long, from breechface to muzzle. Each gun weighed about 239,000 pounds (108,000 kg) without the breech, and 267,900 pounds (121,517 kg) with the breech. They fired projectiles weighing from 1,900 to 2,700 pounds (850 to 1,200 kg) at a maximum speed of 2,690 feet per second (820 m/s) with a range of up to 24 miles (39 km). At maximum range the projectile spent almost 1½ minutes in flight. Each turret required a crew of 79 men to operate. The turrets themselves cost US$1.4 million each, to which the cost of the guns had to be added. The turrets (technically they are "gunhouses") were "three-gun", not "triple", because each barrel could be elevated and fired independently. The ships could fire any combination of their guns, including a broadside of all nine. The turret interiors were subdivided and designed to permit the independent loading, elevation and firing of each gun. Each turret was also installed with an optical range finder, ballistic analog computer, and a switchboard. The rangefinder and ballistic computer permitted the turret's gun captain and crew to locally engage targets, should battle damage disrupt communication with the ship's primary or auxiliary fire control centers. The firing switchboard allowed any remaining fire control computer to send data to or control the firing computers of other turrets in the event of battle damage to the primary and secondary artillery plotting rooms. Contrary to popular belief, the ships did not move sideways noticeably when a broadside was fired; this is simply an illusion. With the enormous mass of the vessel and the damping effect of the water around the hull, the pressure wave generated by the gunfire was felt much more than the slight change in lateral velocity. The guns could be elevated from −5 degrees to +45 degrees, moving at up to 12 degrees per second. The turrets could rotate about 300 degrees at about 4 degrees per second and could even be fired back beyond the beam, which is sometimes called "over the shoulder". A red stripe on the wall of each turret, just inches from the railing, marked the limit of the gun's recoil as a safety warning to the turret's crew. Complementing the 16"/50 caliber Mark 7 gun was a fire control computer, in this case the Ford Instrument Company Mark 8 Range Keeper. This analog computer was used to direct the fire from the battleship's big guns, taking into account several factors such as the speed of the targeted ship, the projectile's travel time, and air resistance. At the time the Montana class was set to begin construction, the rangekeepers had gained the ability to use radar data to help target enemy ships and land-based targets. The results of this advance were telling: the rangekeeper was able to track and fire at targets at greater range and with increased accuracy, day or night. This gave the US Navy a major advantage in the later half of WWII, as the Japanese did not develop radar or automated fire control to the level of the US Navy. During their reactivation in the 1980s, the modern Mark 160 Fire Control System was used to guide the fire of the Iowa-class Battleship Mark 7 guns. The Mark 7 gun was originally intended to fire the relatively light 2,240-pound (1,020 kg) Mark 5 armor-piercing shell. However, the shell-handling system for these guns was redesigned to use the "super-heavy" 2,700-pound (1,200 kg) APCBC (Armor Piercing, Capped, Ballistic Capped) Mark 8 shell before any of the Iowa-class battleship's keels were laid down. The large-caliber guns were designed to fire two different 16 inch (406 mm) shells: an armor-piercing round for anti-ship and anti-structure work, and a high-explosive round designed for use against unarmored targets and shore bombardment. The Mark 7 guns and the 2,700-pound projectiles were 25 percent lighter than the 46 cm/45 Type 94 naval guns of the Japanese Yamato-class battleships, but had the same armor penetration ability. The North Carolina and South Dakota classes could also fire the 2,700-pound Mark 8 shell, although with a shorter range, using the 16"/45 caliber Mark 6 gun. The Mark 6 gun was lighter than the Mark 7, which helped both battleship classes to conform to the limits of the Washington Naval Treaty. The Mark 8 shells gave the North Carolina, South Dakota, and Iowa classes the second heaviest broadside of all battleship classes, even though the North Carolina and South Dakota ships were treaty battleships. Only the Yamato-class super-battleships could throw more weight. The D839 propellant (smokeless powder) grain used for full charges issued for this gun was 2 inches long (5.08 cm), 1 inch in diameter (2.54 cm) and had seven perforations, each 0.060 inches in diameter (0.152 cm) with a web thickness range of 0.193 to 0.197 inches (0.490 to 0.500 cm) between the perforations and the grain diameter. A maximum charge consists of six silk bags–hence the term bag gun–each filled with 110 pounds of propellant. Yard workers hoist one of nine 16"/50 Mark VII gun barrels aboard the USS Iowa during her construction in 1942. The 16-inch/50 caliber Mark 7 guns of the forward turret of the battleship USS Wisconsin (BB-64) fires at enemy targets ashore on the Korean Peninsula on 30 January 1952 during the Korean War. Employees working with the automatic 16-inch powder stacking machine at Naval Ammunition Depot Hingham, Mass. during World War II. The built-up gun is constructed of liner, tube, jacket, three hoops, two locking rings, tube and liner locking ring, yoke ring and screw box liner. Some components were autofretted. Typical of United States naval weapons built in the 1940s, the bore was chromium-plated for longer barrel life. It uses a Welin breech block that opens downwards and is hydraulically operated. The screw box liner and breech plug are segmented with stepped screw threads arranged in fifteen sectors of 24 degrees each. Off of Truk Atoll on 16 February 1944, Iowa and New Jersey engaged the Japanese destroyer Nowaki at a range of 35,700 yards (32.6 km) and straddled her, setting the record for the longest-ranged straddle in history. Some reports indicated the near misses caused splinter damage and casualties to the crew. The Nowaki was able to escape due to the range and her speed. The action against the Nowaki was part of Operation Hailstone. This was the only known surface engagement that Iowa class battleships engaged in. In the action they participated in the sinking of the IJN light cruiser Katori, the destroyer Maikaze, and the auxiliary cruiser Akagi Maru. The gun was also used as the basis for Project HARP, an experimental gun-based space-launch research program. Note: The primer cartridge can be either electric or percussion fired. 290 Megajoules for the light projectile or 355 Megajoules for the heavy projectile. ^ a b c d DiGiulian, Tony (November 2006). "United States of America 16"/50 (40.6 cm) Mark 7". NavWeaps.com. Archived from the original on 5 February 2007. Retrieved 25 February 2007. ^ Landgraff, R. A.; Locock, Greg. "Do battleships move sideways when they fire?". NavWeaps.com. Archived from the original on 9 May 2008. Retrieved 19 May 2008. ^ "Mark 7 16-inch/50-caliber gun". Federation of American Scientists. Archived from the original on 11 March 2007. Retrieved 12 March 2007. ^ Clymer, A. Ben (1993). "The Mechanical Analog Computers of Hannibal Ford and William Newell" (pdf). IEEE Annals of the History of Computing. Massachusetts Institute of Technology. 15 (2): 19–34. Retrieved 8 October 2011. ^ "16"/50 caliber Mark 7 gun". NavWeaps.com. 2009. Retrieved 8 May 2017. ^ "16"/50 caliber Mark 7 gun". NavWeaps.com. 2009. Retrieved 20 May 2012. ^ "USA 16"/45 (40.6 cm) Mark 6". NavWeaps.com. 2009. Retrieved 8 October 2011. ^ DiGiulian, Tony (July 2015). "United States of America 16"/50 (40.6 cm) Mark 7". naval website. Retrieved 23 November 2015. Wikimedia Commons has media related to 16"/50 caliber Mark 7 gun.